The Libra Equinox is a portal into the balance, harmony and equilibrium of the soul. At this time we are shown the entry into the Inner Temple of our Being as we go into the silence of the soul. This temple is built on our foundation of beauty and balanced relationship between the masculine and feminine in our consciousness. The inner marriage of the soul and spirit creates Justice. Justice is the true balance of the Light and Dark within us. 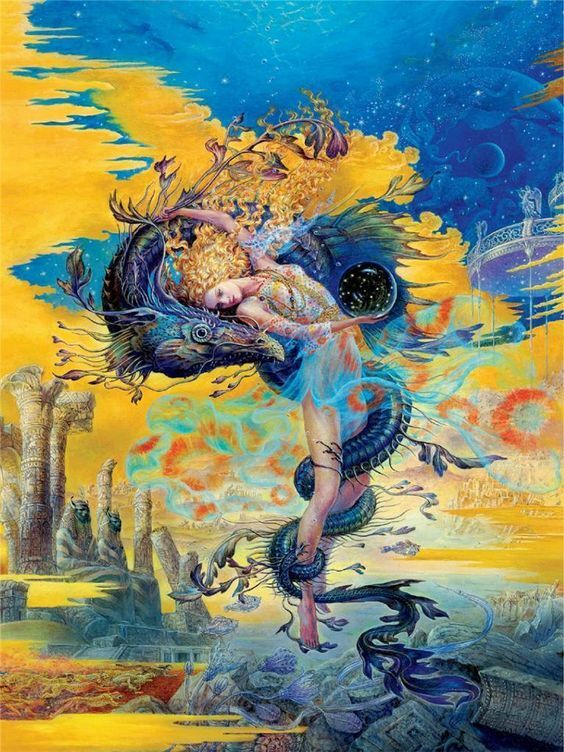 When things are out of balance, the inner psyche uses the powers of Libra to call things back into Divine Order until we are able to merge into the Infinite and become the embodiment of our Higher Self. The inner temple is the masterpiece of our soul, the great alchemy and Art of the human experience. When the mystery of the inner temple begins to unfold within us, we stop becoming seekers and we start to call forth the Wisdom of our own soul from within. We realize that we are the ones we have been waiting for. The Temple of Light is within us. Through our own inner temple we are able to connect with the entire Cosmos. This temple requires our purity of thought and love. Although we may sample many things of this world on our journey to the temple, we leave it all behind as we merge into the pure crystalline silence of our Deep Inner Self. Our consciousness has to be pure to touch the depths of Her. The more superficial layers can tolerate mind altering substances, but the Mother Deep demands our pure presence and stillness for Her to dilate and let us enter. She is the Great Initiator of the soul and hands over the power of the Universe to the one who is ready to walk with such awesome power and responsibility. The heart that has purged all hatred and judgement of one's self and others, is prepared to meet the Inner Dark Light of the soul. Here we understand why we forgive, why we listen, and why we love all beings unconditionally. Here we know that giving and receiving are the same act. To be clear, to be awake and pristine, is the greatest power we can have. Our Consciousness is of such a divine order. We realize how polluted the consciousness of the world has become, adorned in fake jewels and carnal desires that bring decay to the heart. We have compassion for our misguided treatment of the Divine within ourself and all beings. We now see clearly but without judgment, for we know that to judge means death. Once we have tasted the Light of our Inner Temple - no other substance can compare to or come close to it's expansion and fullness. We know the Pleroma of our soul, the Divine Mother of all life within us. All attempts to travel the realms of matter through a synthetic manipulation of light are seen for what they are; a picture show of the shadow lands, empty and temporary. Once the Truth is tasted we wish to mirror It in all that we do, both in love and in creativity. We may still taste anything of this world that we desire, but why would we lay down pure power and love to taste the counterfeit? We know that this cannot be told, only reflected in our creations; our living Word; transmitted through the fluid of our Love, Forgiveness and Compassion and the true Vision of our Heart. We return to shine this truth through our eyes, until the collective awakening takes hold of the heart of humanity. We now recognize those who have been to the Deep by the light in their eyes and the silence in their aura as well as the true power of their words and their art. They emanate divine love and depth and open the hearts of those who come into their field. We intuitively join with them in the network of stars on this planet, lighting up the Universal Soul Matrix. We are not alone, ever; all is Goddess! With Infinite Love from the Inner Temple of Light! We have entered the period of the Great Shift in consciousness on Earth. If things appear to be chaotic it is because all is being sorted out at this time. The truth is rising to the surface and the frequency of every human heart is being revealed. Wherever we find ourself in our heart's evolution at the time of Saturn conjunct the Galactic Core in Sagittarius in late November 2017, will be our starting point in the next cycle of alchemy on this planet. Saturn at the heart of the Goddess will determine our collective and individual lessons and our physical reality as the vibration on the planet is rising and quickening to call forth a New Era. Saturn governs our life lessons and karma and determines what we birth into form. This force can work for us or against us depending on our alignment and our willingness to learn. Saturn at the Galactic Center is synching the frequency of the above and below. We have been given the tools to open our heart. We have been shown the way to treat others if we wish to live as gods and goddesses and carry the Divine Template forward into creation. Spiritual work and spiritual language means nothing if we continue to use our words and our power to hurt others, condemn others or judge others. This goes for hurting, condemning and judging ourself as well. There is an inner rage that continues to be a parasite on humanity. This rage can be transmuted by walking the healing path of honesty and love. We are allowed to be human and we are allowed to make mistakes; but the work remains the same; the rage that comes from the destructive human ego is nothing but a block to the spiritual wealth within. We must clear our rage, and that may mean releasing it through a series of events, but in the end, it must be taken care of and let go for good. Outrage at injustice is part of our healing and growth, and how we channel this energy determines our potential for healing the situation and calling forth Grace. When we speak of the divine Rage, we are talking about the force of the Holy Spirit. This is not an ego/personality motivated rage. This is the swift sweep of the lightening bolt of the Divine Mother that realigns what has fallen into the denial of life. Human beings are not privy to this power until we have cleared all personal motives and lust. During the coming months and all next year we are also being asked to take inventory of our sexual energy. With Jupiter in Scorpio in 2017 and 2018, the underbelly of human sexuality will be brought to the surface for the individual as well as the collective. Here we are asked to understand that our sexuality is the creative force of the Feminine, and we are encouraged honor that sacred part of our soul by connecting our sexuality to wisdom and love. In the coming year we will be asked to heal all sexual wounds to prepare our body and consciousness vehicle to hold greater amounts of Divine Love. We are already starting to see the influence of Jupiter in Scorpio on the world stage. This is only the beginning of the revelations of sexual abuse on our planet that is happening on a massive scale. We will purge it out now until we can accept the responsibility for this powerful force and learn how to use it with wisdom, love and discernment and respect for the divine sovereignty of all souls. Personal healing is not optional during these times. We either decide to heal our relationship to our inner light and dark or we face the mirror of our own unchecked demons. All of us have been hurt deeply by the many unconscious cycles of our soul. We have deep wounds in our heart that can be transmuted into great power. Now is the time to face this beautiful challenge and know who we really are. Now is the time to love ourself and love our fellow human beings. Many human beings carry great darkness and have no desire to heal and come into a more harmonious relationship with humanity. Some of these souls will eventually face the truth of their actions and some will be provided the opportunity to go into greater darkness where the conflict will be worked out by the lightening tower of the Divine Mother. At some point in our journey we are asked to ascend the stairs of consciousness and operate from the next level. This means the decision to make an intention that is followed through with real adventure, disciplined action and effort and it might not be easy. We may bruise and scrape our knees, we may grunt, groan, cry and scream, but like a toddler making its way to the second level of the house for the first time, we do it because we must and we are driven to by our inner nature. We look back and see the lower level. We know that we are not going back down; we have a new level to explore. We turn to those who are still on the lower level with a smile. We'll be back after we have seen the new space; when we have news to report and we are sure that we can make the journey back up safely and with ease, helping others to awaken their courage to do the same. The temptation at this time is to blame the dark forces for all of the chaos. The dark feeds where there is opportunity. Many have created the opportunity to host the dark through lifetimes of turning their back on love. All of us are accountable for our actions. It makes no difference who we are. We are all put to the scales to see how much love our heart has birthed. Each and every one of us has been to the lowest place in creation. We make our way back by learning how to love from a place of Wisdom and Power. Creation always supports us in our journey, even when it seems that we have been abandoned. This is Cosmic Law and cannot be broken. There has been a trend to say that the journey of Ascension is not all love and light. This can be very deceiving and those who take this message in deeply often times have not understood or experienced the real power of love. If they knew it, they would understand that Love is the only power and we are made of nothing but Light. To really get this, one must touch the inner Divine Love in the heart. This is the presence of Source, the Divine Spark within us. In this Presence, all else dissolves. The inner Christic Light shows us nothing but love and light and as we merge we are given the power to direct this powerful flame. From this place we are capable of addressing the horrific imbalances in the world without adding to them further with our own actions We hold the space of the new paradigm with unshakable faith. There are indeed a multitude of dark forces affecting us every step of the way. These forces exist within us, on the planet and from an interdimensional frequency. All of the ancient texts refer to these forces. They have always been present. Now, the time has come for them to be revealed to humanity. Nobody knows for certain how this will happen, but it is very important for us to stay connected to our heart, our family, and our inner guidance to know how to respond to all things that appear before us in the present moment. Faith, Hope and Love are the most valuable assets for us during these times. All of these will awaken the discernment of the heart. Unconditional Love is a reality. Although much is spread on the internet and social media about human love as meant to be messy and painful; the love of the Christic-force and the love of the Divine Mother is unconditional. We all have this seed within us and we are indeed, meant to birth it. The process may involve great pain and suffering as we temper the ways of the ego, but the feeling a mother has for her child is much the same as unconditional love for humanity. We are meant to arrive at this level of love in our love relationships. There are many teachings around this topic that will be revealed to the masses as the vibration rises on the planet. Most of humanity feels threatened at this time to even hear about the depth of love that is not being expressed. It triggers great fear and so the teachings are being kept for the time of our true awakening. Lust is so great in our world and it stomps out the platform in the human consciousness that is meant to hold Unconditional Love. When the human heart awakens fully, the ability to digest the Wisdom of Sophia will become a reality. Act as if you are transparent at all times and this will keep you in true alignment with the coming Age. Many who consider themselves to be messengers of spiritual information and truth conduct themselves privately in ways that take from others. This is happening very frequently. All is seen in this world. If you have cleared the ego you will be shown the actions of human beings from the inner dimension. This is not always fun to see that many who would be allies are still working with great feelings of entitlement, competition and fear. Many from the same soul and soul group undermine each other behind closed doors. This is unfortunate for the work but it never goes unbalanced. All actions, especially those coming from souls who are here to hold light are held to the Law of Accountability. For in order to be a link in the great chain of the Brotherhood and Sisterhood of Light, one must be clear in the heart and in impeccable integrity. Until we reach this point, we are vulnerable to dark attacks from the weak link within our auric field. When we are accountable to our Spirit, we cannot be manipulated by any human being or dark force. Our true accountability is to our own Higher Self who knows the path of our highest destiny. This Golden Key is available to all of us now. It's time to start living and connecting from the awakened heart; from this state, the wave of Divine Love flooding the planet will catch hold of us and lift us up together. To book a private session with Shannon or to find out more about her 3-Month Mentoring Program in the Divine Feminine Wisdom.